Remembering the pottery industry in the Palestinian city of Hebron to jump to memory Fakhouri family that she started the craft, and inherited from their ancestors decades ago. This is an important source of family the best kind of pottery was locally made, and became their products up to the markets near and far despite the many obstacles they face as a result of occupation and living conditions. After the strict measures of the occupation in the old city of Hebron, the family had to move her career Fakhouri heritage to the industrial area in the city to continue work from there profession grandparents and parents. The owners say they are notorious for their craft Bmsnoathm the Old City of Hebron and near the Ibrahimi Mosque, where markets were open, and visitors come from everywhere and buy beautiful antiques. According to Salah Fakhouri Sun heirs to the profession they Toatera craft and learned from their ancestors, who less serious tone nearly three hundred years, until he became the family now have seven plants and factories for pottery hand-worked by more than a hundred people of all ages. And the profession about the nature of change between past and present, the man stated that the entry of technology, specifically electricity helped to shorten the production time pointing out that the nature of the products also have been changed where they stopped the manufacture of pottery jugs, dishes and eating utensils, cooking and went to the tourist industry as an industry artifacts, landscapes, flowers and other basins. And on the stages of pottery production, "said Fakhouri It starts to bring the soil type" cloud ", which mixes with soil and some ordinary red sand and certain proportions of water and leave for a month and then dried under the sun for ten days, the hue and stored for periods up to a year, but after twenty days beginning the process of mixing the mud again and manufacturing by craftsmen. After completion of the pottery types indicated that they leave one day and then two days the sun shade, and then burn in the oven temperature about 1000 degrees Celsius for a full day. Then a product as a reddish color but if you add salt to anything, it would be closer to white, and then becomes a viable marketing and use, sticks to break. On the pottery market, Fakhouri said it goes beyond the Palestinian territories to Israel and neighboring countries to European countries and America, which imports a lot of grooming products, especially manufactures small-sized ones. For his part, Abdul Salam Fakhouri, which operates in this profession 25 years ago he inherited from his father, Industry and grandparents, citing weakening sales market, compared with a situation seven years ago. He also said he is keen to innovate its product and invent new forms of pottery and to enter the market, but complain about the decline in sales to more than half, at a time when increased production and marketing costs significantly. As if the industry had affected him particularly on the hands of the frequent use of mud, Abdel-Salam said he was not suffering from any problem, pointing out that the pottery depends on the nature and specific soil and one hundred percent free of any chemicals or harmful. Does not appear to Abdul Salam Fakhouri concern for the future of this profession in particular and more than a hundred people employed by the family, but said it needs to both amateur and skilled and encouragement to continue. 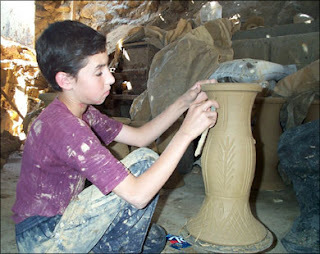 1 Response to "Pottery craft inherited by family Fakhouri Palestine"